Our partner school in New York, Brooklyn School of Languages, is located just over the Brooklyn Bridge. This means the school is just one subway stop away from Manhattan. This way you'll get to live in a neighborhood of New York that has kept all its natural beauty, charm and sophistication, without any of the stress of living in such a big city. It is like living a village in one of the biggest global cities! And whenever you want to explore the rest of the city, there are plenty of public transfer options that take you right into Manhattan! The school itself is an independent language school with a strong focus on customer satisfaction, providing a comfortable learning environment for their students. Located in the heart of Brooklyn Heights (only a 5 minute walk from Brooklyn Promenade), you’ll have all the facilities of a big city, such as shops, restaurants and bars, as well as excellent connections per subway (2, 3, 4, 5 and R lines stop right outside the school entrance). The school offers optional activities and excursions during your language course. Some activities are free; others are available against a small fee. Examples of activities are: sport events, concerts, festivals, movie nights, a tour of iconic locations or famous buildings, fashion shows, museum visits and exhibitions. The school, furthermore, publishes a weekly activity programme of things to do in the city. This will help you navigate through the famous city of New York and learn aboutall the interesting events going on in the city! The intensive course consists of 20, 22 or 30 lessons per week (1 lesson = 45 minutes) and are held in small classes of max. 12 students. The course is designed to learn English in an effective and enjoyable way, with a communicative approach (including pair and group work activities that motivate students to communicate). For the courses with 20 or 30 lessons per week, you can start with a beginner level of English. For the course with 22 lessons, you’ll need at least pre-intermediate level. All levels start with a placement test on the first Monday (8.15 - 9.45am). For the courses with 20 or 30 lessons per week, you can start with beginner level of English. For the course with 22 lessons, you’ll need at least pre-intermediate level. Visa: In case you need a Visa, the intensive course with 20/22 lessons per week are suitable for a tourist visa, but the intensive course of 30 lessons requires an F1 student visa. A shared room in a shared apartment has 2 single beds, and is available to students traveling alone, who will then share with another student of same gender. Students will be asked to leave a € 93 security deposit by credit card at school on the first day. It will be refunded back on to the card once the school has checked the bedroom for cleanliness, laundered sheets, any damage etc. A double room in a host family can only be booked by 2 persons travelling together. Students will be asked to leave a € 93 security deposit by credit card at school on the first day. It will be refunded back on to the card once the school has checked the bedroom for cleanliness, laundered sheets, any damage etc.. The accommodation in the residence is only available for a minimum stay of 2 weeks. A shared room in the residence has 2 single beds, and is available to students traveling alone, who will then share with another student of same gender. this price is valid for a one-way transfer on arrival at JFK/ La Guardia airport. If you arrive at Newark Airport, the price is € 166. Please indicate in which airport you are planning to arrive. The prices apply for arrivals between 8am-10pm. A € 37 supplement will be charged for early/late arrival. 01/01/2019, 18/02/2019, 27/05/2019, 04/07/2019, 02/09/2019, 07/10/2019, 21/11/2019, 22/11/2019, 23/12/2019 - 27/12/2019.Missed lessons due to bank holidays will not be refunded or rescheduled. If you need to apply for a visa and want the school to send the I20 form by express mail, a surcharge of € 70 applies. *teaching materials: first book is included in the price; every subsequent books cost € 47 per book (1 book every level, approx. 8 weeks), payable on site. The combined course consists of an intensive course of 20 lessons + 3 private lessons per week (in the afternoon). This way you’ll be able to focus on the areas of weakness or discuss a topic of special interest. You can start any Monday. Group lessons are held in the morning (Monday 10am - 1:15pm, and Tuesday-Friday from 9am - 12.15pm), and the private lessons can be scheduled at flexible times during the week. This course requires at least an upper intermediate language level. One-to-one lessons are the best way to really focus on your weaknesses in the English language, or simply to make quick progress in relatively short time. You can discuss your own requirements and goals with us in advance, in order to get a total tailor made English language program to suit your needs. You can also take individual lessons to prepare for an exam or entry into a university. Choose between 10 or 20 lessons a week (other amount of lesson on request). One of the best options to improve your English even more during your stay in New York is living with an American host family! You can choose a single room or double room (only for 2 students travelling together) and select breakfast or half board (breakfast and dinner). If you choose the option for breakfast only, please note you cannot use the kitchen. In case you don’t want to book any meals, please contact us for prices with the possibility to cook. In comparison to other language schools in New York, the host families of Brooklyn school of Languages Host families live within a relatively short subway ride from the school, at approximately at 30 minutes travel time. Towels and bed linen are provided. Homestays with private bathrooms are also available on request and at an extra cost. If you choose the shared apartment accommodation, you’ll stay in the school’s shared student house, located in Bedford–Stuyvesant, a neighbourhood of 153,000 inhabitants in the north central portion of Brooklyn. You’ll be surrounded by lots of stores, bars and restaurants on avenues such as Lewis, Bedford and Marcus Garvey. Travel time to the school is approximately 20 minutes by subway (a direct line!). The 1800-sq ft. House is shared with other students from Brooklyn School of Languages and consist of: 3 bedrooms, 2 bathrooms, a large kitchen and living room, and an outdoor space (only accessible from the shared room). The kitchen has a full array of modern appliances including a large fridge and microwave. You will share the common areas of the house (kitchen, living-dining room, and bathrooms) with the other students, and will have full access to the equipped kitchen to cook your own meals. Bed linens are provided but students should bring their own towels. Wi-Fi is available for free. The house’s common areas will be cleaned once a week, students are responsible for the cleanliness and tidiness of their bedroom. The residence is located in the up-and-coming neighborhood of Bushwick, in the nothern part of Brooklyn, between the trendy neighborhoods of Williamsburg an Bedford-Stuyvesant. This area has become associated with colorful street art and lots of galleries, boutiques, restaurants and bars. The newly renovated house features 4 floors of exclusively designed spaces with centrail air conditioning, hardwood floors, washing/drying machine, and 24/7 security in all common areas. Each floor has its own living space with bedrooms, bathrooms and modern kitchens. In total there are 14 bedrooms, 3 fully-equipped kitchens, 5 bathrooms, a living/coworking space in the basement and a spacious backyard. Bed linens and towels are provided. Wi-Fi is available for free. The house is cleaned professionally twice a week. You can choose to book a private or shared room, that you will share with a student of the same gender and different nationality. 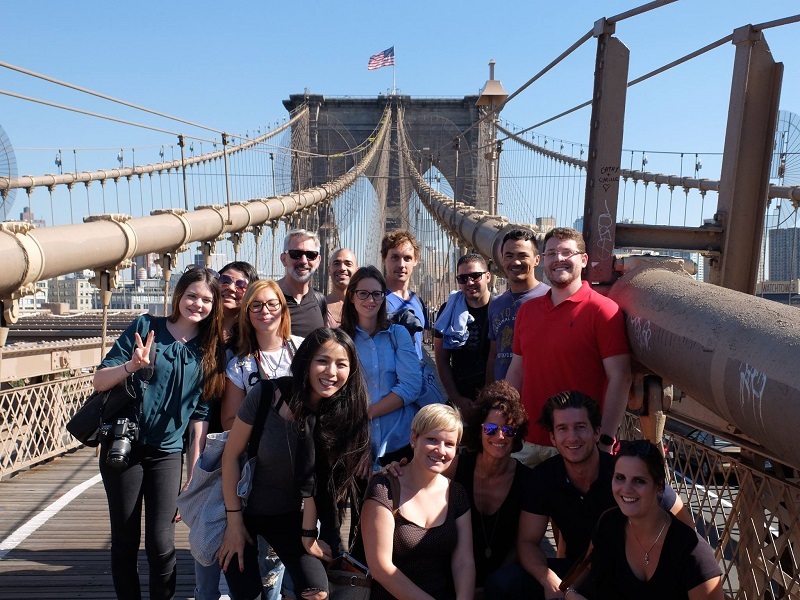 This option is perfect for more independent students who wish to meet and interact with fellow international students and New Yorker locals during their stay. Please note that this option requires a minimum stay of 2 weeks. The travel time from the residence to the school is about 40 minutes.